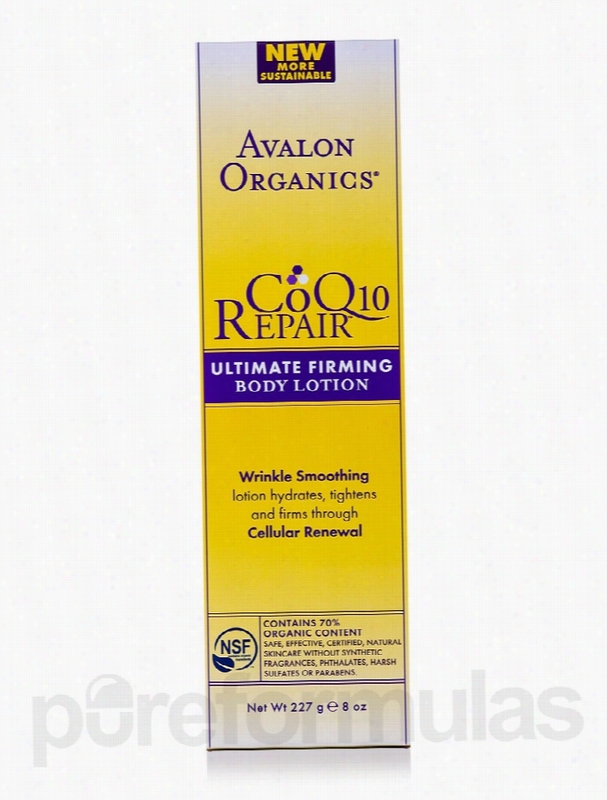 Avalon Organics Skin Care - CoQ10 Repair Ultimate Firming Body Lotion. CoQ10 Repair&trade; Ultimate Firming Body Lotion 8 fl. oz from Avalon Organics&reg; might help you maintain tight&sbquo; firm&sbquo; and young looking skin. This firming lotion from Avalon Organics&reg; has the right ingredients that may help you maintain good&sbquo; healthy skin. As the skin ages&sbquo; the cellular energy in the skin reduces. This superior moisturizing lotion contains aloe&sbquo; safflower Oil&sbquo; green tea extracts&sbquo; and camphor oil to support skin health. The safflower oil used here may act as a barrier that prevents moisture from leaving the skin. This could keep the skin hydrated and supple. Safflower oil might also reduce roughness and promote the texture of the skin. The linolenic acid present in this oil may have the ability to remove oil and dirt&sbquo; while also conditioning the skin. Green tea present in the lotion might provide ample antioxidant and anti-inflammatory support&sbquo; which could reduce the appearance of wrinkles and sagging skin. Cinnamomum camphora present in the lotion might help relieve conditions like itching&sbquo; irritation&sbquo; and redness. CoQ10 Repair&trade; Ultimate Firming Body Lotion 8 fl. oz from Avalon Organics&reg; may regenerate tired skin to make it look younger and healthier. These statements have not been evaluated by the Food and Drug Administration (FDA). These products are not meant to diagnoseÃ¢ÂÂ treat or cure any disease or medical condition. Please consult your doctor before starting any exercise or nutritional supplement program or before using these or any product during pregnancy or if you have a serious medical condition. Alba Botanica Skin Care - Natural Hawaiian Hand & Body Lotion. 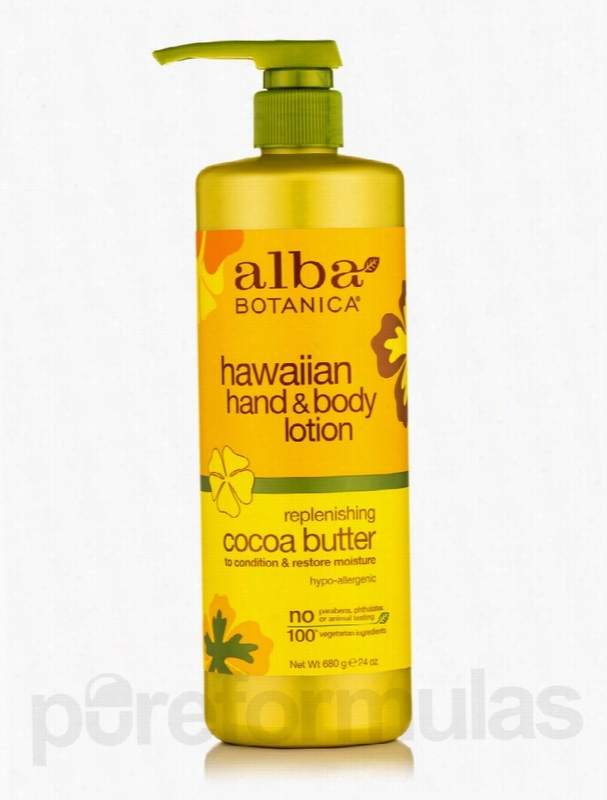 Natural Hawaiian Hand &amp; Body Lotion Replenishing Cocoa Butter by Alba Botanica helps repair dry skin. Absorbs quickly to relieve dry skin Nourishes and moisturizes Natural Hawaiian Hand &amp; Body Lotion Replenishing Cocoa Butter includes Cocoa Seed Butter. Cocoa Seed Butter helps penetrate further than the top layer of the skin&sbquo; and nourishes deep into the skin. Cocoa Seed Butter could help in reducing stretch marks. Aloe Vera helps relieve the discomfort of dry&sbquo; irritated skin. Shea Butter has deep moisturizing&sbquo; healing&sbquo; and regeneration properties. Sunflower Seed Oil helps the skin to retain its moisture. Natural Hawaiian Hand &amp; Body Lotion Replenishing Cocoa Butter gives skin moisture and elasticity. Natural Hawaiian Hand &amp; Body Lotion Replenishing Cocoa Butter 24 oz. (680 Grams) Includes the Following Ingredients: Aloe Barbadensis Leaf Juice: Helps relieve the discomfort of dry&sbquo; irritated skin Butyrospermum Parkii (Shea Butter): Has deep moisturizing and skin healing properties Theobroma Cacao (Cocoa) Seed Butter: Helps reduce stretch marks Helianthus Annuus (Sunflower) Seed Oil: Helps the skin to retain its moisture These statements have not been evaluated by the Food and Drug Administration (FDA). These products are not meant to diagnoseÃ¢ÂÂ treat or cure any disease or medical condition. Please consult your doctor before starting any exercise or nutritional supplement program or before using these or any product during pregnancy or if you have a serious medical condition. 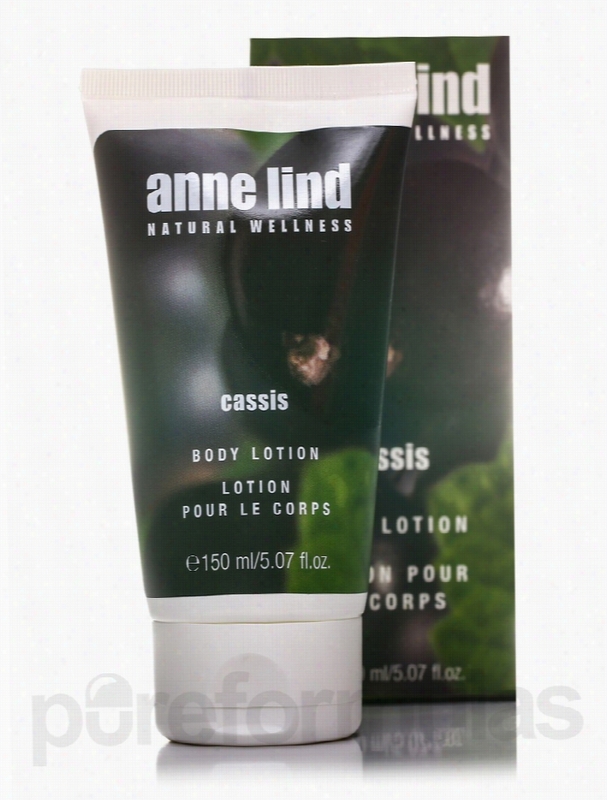 Annemarie Borlind Bath and Body - Anne Lind Body Lotion - Cassis -. Anne Lind Body Lotion from Annemarie Borlind may help rejuvenate your mind and body during your morning routine. This body lotion may help nourish the body for a perfect moisturizing effect and could provide aromatherapeutic care to the mind and body. Researchers claim that aromatherapy may help elevate mood&sbquo; cognitive function&sbquo; and physical well-being. This product from Annemarie Borlind is suitable for all skin types. The product contains the cassis aroma&sbquo; which is said to provide a flowery&sbquo; sensual&sbquo; and soothing scent. This product also contains water&sbquo; which may have a hydrating effect on the skin and could nourish depleted skin cells. This lotion also contains jojoba&sbquo; which could have a soothing impact on the skin and possibly unclog hair follicles&sbquo; which may prove beneficial in the optimal delivery of nutrients. The lotion also features shea butter&sbquo; which is derived from the nuts of the shea butter tree that is naturally grown in Africa. Some claim that shea butter could deliver vitamin A and E&sbquo; which may prove crucial for skin health. This product is free from preservatives&sbquo; hydrated oils&sbquo; and silicone. Try Anne Lind Body Lotion from Annemarie Borlind today!. These statements have not been evaluated by the Food and Drug Administration (FDA). These products are not meant to diagnoseÃ¢ÂÂ treat or cure any disease or medical condition. Please consult your doctor before starting any exercise or Nutritional supplement program or before using these or any product during pregnancy or if you have a serious medical condition. ATOPALM Moisturizing Body Lotion 10 oz. This lightweight, paraben free body Lotion has a unique, patented Multi Lamellar Emulsion technology that provides ultimate skin moisture. This lotion also helps retain the skins' own moisture. Vitamin E helps defend the skin from environmental stresses while Allantoin helps to calm and soothe distressed skin. This quickly absorbed lotion works to leave the skin feeling soft, smooth, supple and more radiant.Benefits:Helps to soothe, calm and moisturize dry, sensitive or sun damaged skin.Formula is gentle, yet effective. Weleda Bath and Body - Calendula Body Lotion - 0.34 fl. oz (10 ml). Gently nourishes and moisturizes delicate skin!Travel Size &ndash; Weleda Calendula LotionCalendula Lotion gently nourishes your baby&rsquo;s delicate skinThis light&sbquo; nourishing all natural baby lotion provides long-lasting protection from environmental drying influences. Particularly good for use after baby&rsquo;s regular bath&sbquo; Calendula Lotion leaves your loved-one glowing with soft&sbquo; supple&sbquo; moisturized skin.Comfort your baby with this soothing all natural baby lotionThis all natural baby lotion contains organic calendula flower extract that soothes skin inflammation and wraps your child in a nurturing layer of warmth&sbquo; like a loving hug. A light base of sweet almond oil ensures easy absorption of our moisture-rich Calendula lotion&sbquo; while beeswax smoothes your baby&rsquo;s skin and protects from dryness. You may be constantly replacing outgrown clothes&sbquo; but with Calendula Lotion there will always be cuddly comfort in your baby&rsquo;s soft&sbquo; beautiful skin. These statements have not been evaluated by the Food and Drug Administration (FDA). These Products are not meant to diagnoseÃ¢ÂÂ treat or cure any disease or medical condition. Please consult your doctor before starting any exercise or nutritional supplement program or before using these or any product during pregnancy or if you have a serious medical condition. 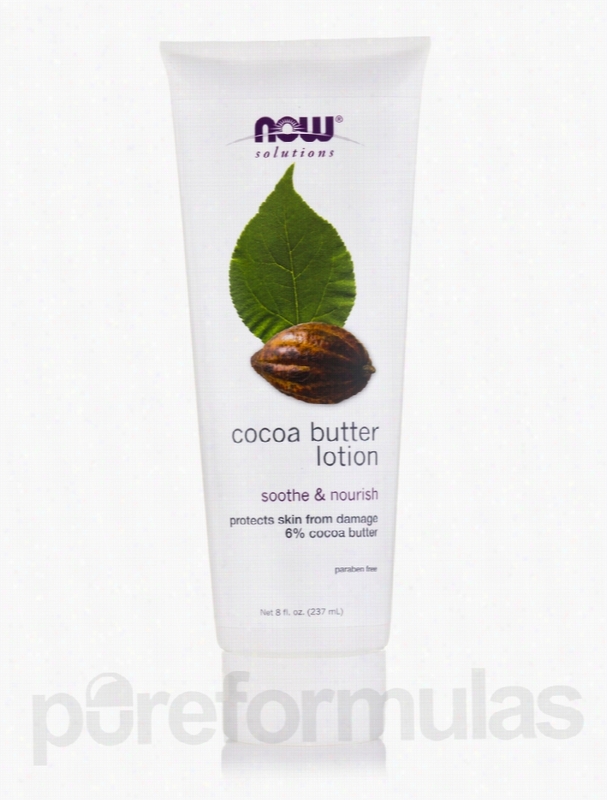 NOW Skin Care - NOW Solutions - Cocoa Butter Lotion - 8 fl. oz (237. Your skin deserves better&sbquo; your skin deserves butter! Cocoa Butter Lotion by NOW is a creamy blend that can help take dry and flaky skin out of the picture&sbquo; and help the body in addressing stretch marks. Formulated with 4% of real cocoa butter&sbquo; this lotion also contains Rhodiola extract&sbquo; as well as extracts such as almond oil&sbquo; allantoin&sbquo; aloe vera&sbquo; and lecithin. These extracts work to repair irritated and inflamed skin by reducing stress in the skin and keeping moisture active. These elements may also help work to stimulate cell regeneration in the body. Now that's helpful! For results&sbquo; simply apply liberal amounts of the cocoa butter lotion to the areas of the body in need. NOW is committed to being the healthiest and safest lotion available. All NOW products are cruelty-free and paraban-free. Try Cocoa Butter Lotion today and receive free shipping from PureFormulas on your order. These statements have not been evaluated by the Food and Drug Administration (FDA). These products are not meant to diagnoseÃ¢ÂÂ treat or cure any disease or medical condition. Please consult your doctor before starting any exercise or nutritional supplement program or before using these or any product during pregnancy or if you have a serious medical condition. Giovanni Cosmetics Bath and Body - Hydrate Cucumber Song Body Lotion -. 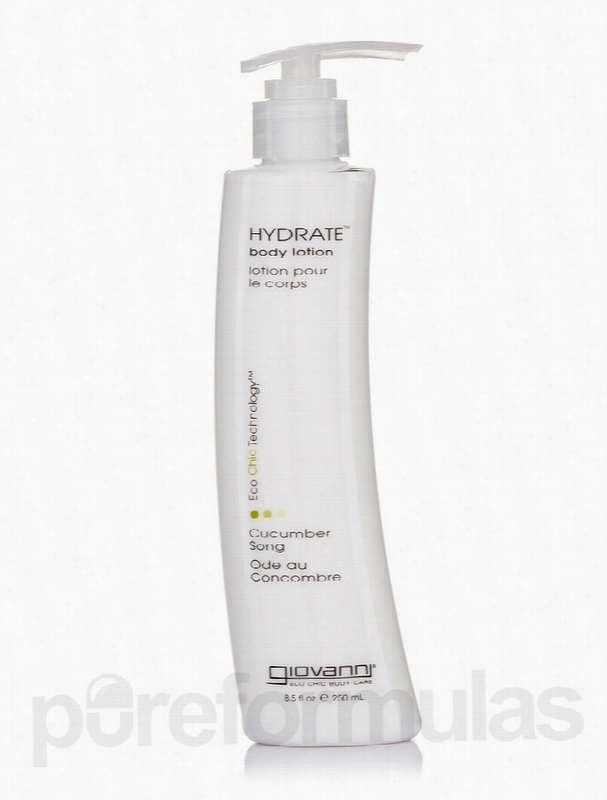 If you want to add moisture to your skin while cleansing it&sbquo; you may pick Hydrate&trade; Cucumber Song Body Lotion from Giovanni&reg; Cosmetics. It might enrich your skin with moisture and hydration. The extracts of hazelnut and vanilla together might ensure that your skin is infused with vitamins and moisture. It could also leave behind a very soothing fragrance on your body after cleansing. Vegetable Glycerin may hydrate your skin's cells and leave your skin smooth and soft. These ingredients may improve dry skin conditions. Sweet almond Oil&sbquo; jojoba oil&sbquo; aloe vera juice and Vitamin E could ensure that adequate amount of dampness are locked into your skin. These ingredients may also improve the texture and tone of your skin. Green tea extracts in the body lotion from Giovanni&reg; Cosmetics might help provide antioxidants to the skin and keep it away from infections. Cucumber&sbquo; mango and papaya extracts along with coneflower concentrates in Hydrate&trade; Cucumber Song Body Lotion from Giovanni&reg; Cosmetics could give a silky smooth and healthy appearance to your skin. These statements have not been evaluated by the Food and Drug Administration (FDA). These products are not meant to diagnoseÃ¢ÂÂ treat or cure any disease or medical condition. Please consult your doctor before starting any exercise or nutritional supplement program or before using these or any product during pregnancy or if you have a serious medical condition. Life Extension Skin Care - Vitamin D Lotion - 4 oz. Over the course of a normal day&sbquo; the epidermis&sbquo; the outermost layer of your skin&sbquo; naturally loses 30-40&sbquo;000 cells per minute. As you get older&sbquo; your skin replaces these dead cells more slowly and produces less natural oil&sbquo; as wrinkles&sbquo; lines&sbquo; and areas of dry&sbquo; rough-looking skin begin to appear. Sun exposure&sbquo; pollution&sbquo; and stress also take a daily toll by heightening the activity of damaging free radicals.Now you can replenish these areas and preserve your skin&rsquo;s youthful radiance with Vitamin D Lotion. This cutting-edge formula supplies rejuvenating factors directly to aging skin to maintain its healthy-looking&sbquo; natural glow.Vitamin D Lotion contains a highly absorbable form of vitamin D3 called cholecalciferol. It readily penetrates the outer layer of your skin&sbquo; nourishing dry areas by helping to lock in moisture before it&rsquo;s lost. This helps to offset the visible impact of your skin&rsquo;s gradually declining ability to renew itself.Because of its quenching action&sbquo; this active nutrient also helps with rough patches&sbquo; dry spots&sbquo; and areas of tough-looking skin that result from dehydration&sbquo; cold weather&sbquo; irritating fabric&sbquo; or repeated friction and pressure. Upper arms&sbquo; elbows&sbquo; knees&sbquo; hands&sbquo; and extremities are especially susceptible. 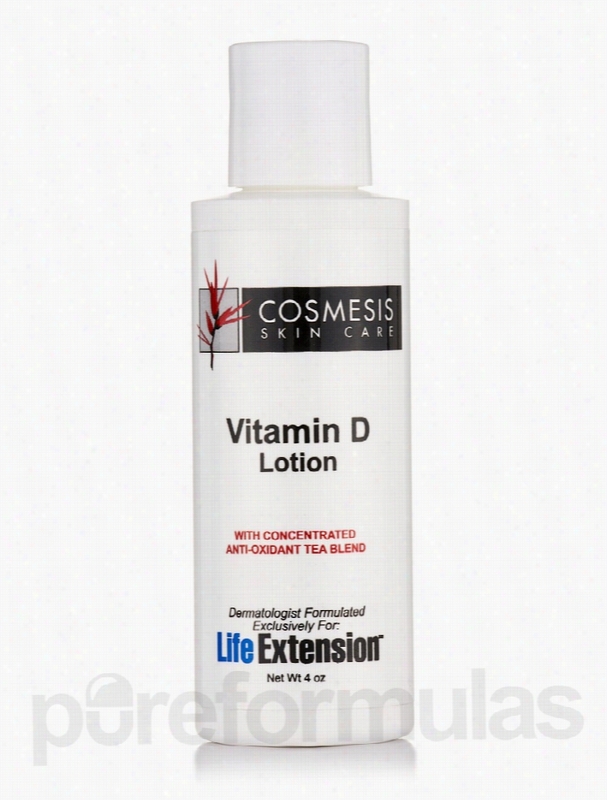 Applying Vitamin D Lotion helps to restore their natural appearance.A proprietary blend of highly refined tea extracts (green&sbquo; black&sbquo; red&sbquo; white) has been added to augment vitamin D&rsquo;s moisturizing and rejuvenating effect with polyphenols and Antioxidants.Use Vitamin D Lotion wherever it&rsquo;s needed&sbquo; for a radiant complexion and soft&sbquo; supple skin. These statements have not been evaluated by the Food and Drug Administration (FDA). These products are not meant to diagnoseÃ¢ÂÂ treat or cure any disease or medical condition. Please consult your doctor before starting any exercise or nutritional supplement program or before using these or any product during pregnancy or if you have a serious medical condition. GlyDerm Face Lotion Lite 5 4 oz. 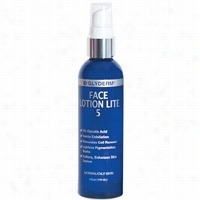 GlyDerm Face Lotion Lite 5 is a gentle, exfoliating, light lotion. Face Lotion Lite 5 is formulated for normal to oily skin. It does not contain petrolatum or mineral oil. The 5% Glycolic Acid formulation softens fine lines and helps minimize the appearance of pigmentation irregularities, revealing smoother, more even skin. Use Face Lotion Lite 5 sparingly at night.Benefits:Softens and enhances skin texture.Provides gentle exfoliation while promoting cell turnover.Diminishes hyperpigmentation marks. 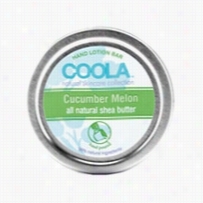 Coola Hand Lotion Bar Cucumber Melon 0.5 oz. The exotic natural butters and oils in Coola's unique Natural Body and Hand Lotion Bars formula maintain a solid form at room temperature.Once gently rubbed, body temperature naturally melts the lotion, absorbing quickly leaving skin soft and silky.Coola Natural Body and Hand Lotion Bars contain an exclusive blend of Shea Butter and other natural oils and emollients to moisturize, protect, and relieve dry and damaged skin. Shea butter is an all-natural moisturizer, high in fatty acids and rich in Vitamins A, E and F.Shea Butter, commonly known as KaritÃ©, is derived from the Shea Nut Tree, which grows in the western region of Africa.In addition to Shea Butter, Almond oil, Avocado oil, Vitamin E and Jojoba extract area encapsulated in a Beeswax base.The Beeswax keeps the natural ingredients working next to the skin, while protecting the skin's moisture.Coola Lotion Bars guarantee no wasted product, they deliver the perfect amount for each use, and are ideal for travel.